HomeElectronicsGadgetsRobotsWhat are Collaborative Robots and How Are They Used? What are Collaborative Robots and How Are They Used? If recent research is anything to go by, collaborative robots are the workforce of the future. Robots have been widely used in the manufacturing industry for many years to replace a human labourer, however collaborative robots or ‘cobots’ are an entirely different ball game. The definition of collaboration is the action of working with someone to produce something, and cobots are designed to work alongside an individual them as a valued part of the team, not replace them entirely. Some operations and activities simply cannot be fully automated, however the process speed suffers if parts are being ferried backwards and forwards between workers on the assembly line and robots locked in cages. Cobots could transform the way we work and manufacturers like Ford have already jumped on the cobot bandwagon. This German factory is successfully using collaborative robots to install shock absorbers on their vehicles with precision and accuracy right on the production line, saving valuable time and money, not to mention boosting their productivity. Here we look at the four main types of cobot currently available. This collaborative feature is used when a cobot is required to work primarily on its own, but may on occasion need an operator to assist. An example of this would be if a worker needs to step in and perform an operation on a part that is being held by a cobot in an automation assembly process. 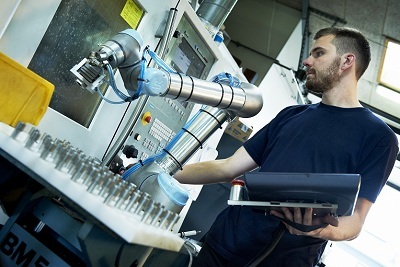 The cobot will sense the presence of a human in its workspace and will cease all motion until the worker has left the predetermined safety zone. The cobot will not resume its actions until it has received a signal from its operators. This function is fairly similar to the Safety Monitored Stop in that the cobot operates within a predetermined safety zone, however the Speed and Separation Monitoring cobot reacts differently to human presence. Rather than simply stopping because someone has entered the safety zone, this cobot will slow down whilst using a vision detection system to continually monitor the location of the person or object that entered the area. If the person or object does become too close to the cobot, it will stop and wait for the person’s proximity to increase once again before continuing. This cobot is used in areas where there are many workers present as it will require far fewer human interventions in order to keep functioning. A Hand Guiding cobot is unique in that it acts like a regular industrial robot, but benefits from an additional end of arm device that is pressure sensitive. This device allows the operator to teach the cobot how hard to hold an object or how fast to move it, in order for it to be securely operated on and/or moved without incurring damage. Hand Guide control robots are useful in production lines where delicate components are being carefully assembled. Perhaps the most worker-friendly machine, this cobot can sense abnormal forces in its path, such as a human or object, in its joints. The cobot is programmed to stop all movement or even reverse the movement should obstructions be detected or contact be made. This is not your regular run of the mill robot, as it is programmed to know how much power and force a human can withstand. The Power and Force Limiting cobot can operate without any additional safety devices thanks to the state of the art robotic technology on board, and is designed for regular, direct collaboration with a human workforce.